Einaudi Center Distinguished Speaker: Gayatri Spivak, "The Rohingya Issue In A Global Context"
Spivak will shed light on the current issues in Myanmar (Burma) related to the Rohingya and situate those issues at the global level. 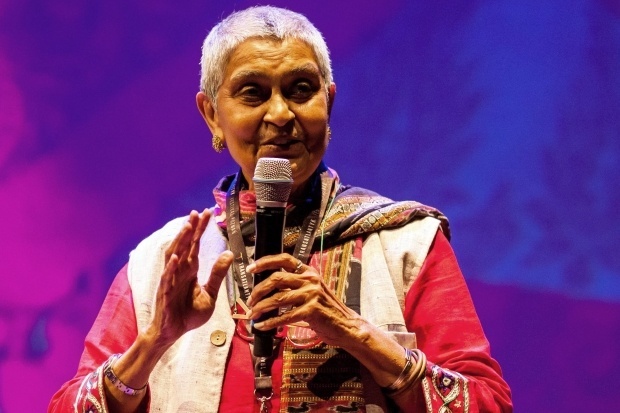 Gayatri Chakravorty Spivak, University Professor in the Humanities, Columbia University, holds honorary degrees from the Universities of Toronto and London, and Oberlin College. Her books are In Other Worlds (1987), Thinking Academic Freedom in Gendered Post-Coloniality (1993), Outside in the Teaching Machine (1993); Imperatives to Reimagine the Planet (1997), A Critique of Postcolonial Reason(1999), Death of a Discipline (2003), Other Asias (2007), An Aesthetic Education in the Age of Globalization (2012), Readings(2014) and Du Bois and the General Strike (forthcoming). She has translated Jacques Derrida's Of Grammatology (1976); Mahasweta Devi's Imaginary Maps (1993), Breast Stories (1997), Old Women (1999), and Chotti Munda (2002); Ramproshad Sen's Song for Kali (2000); and Aimé Césaire's A Season in the Congo (2012). She has been a full-time activist in primary health care, ecological agriculture, and rural elementary education and been involved with feminist social movements from the United Nations through academic theory to the grass roots. This event is jointly organized by the Mario Einaudi Center for International Studies, the Southeast Asia Program, and the Collective of Concerned Students on Global Issues, and cosponsored by the South Asia Program and the Comparative Muslim Societies Program. Wheelchair accessible. Please contact us with questions. Well attended, good questions -- and she was amazing!